In MIDI regions assigned to drum instruments, each MIDI note usually triggers a different sound. When viewed using a regular staff style, the notes have no apparent relationship to the sounds you hear. You can display these regions as a readable drum part with special drum note heads, using mapped instruments and mapped staff styles. When Additional Score Options is selected in the Advanced preferences pane, you can create and edit mapped staff styles. Mapped staff styles allow you to assign individual voices to drum groups, which use specific drum note heads to display note events. You can define the respective drum note head shapes in a Mapped Instrument window. The best way to create drum notation for an existing region is to open the Score Editor to view the MIDI region, and also open the Mapped Instrument window and the Staff Style window. This way, you can directly see how parameter changes affect the score display. Before defining the details of a mapped staff style, you should set up all drum groups, note head shapes, and relative note position parameters in the Mapped Instrument window. 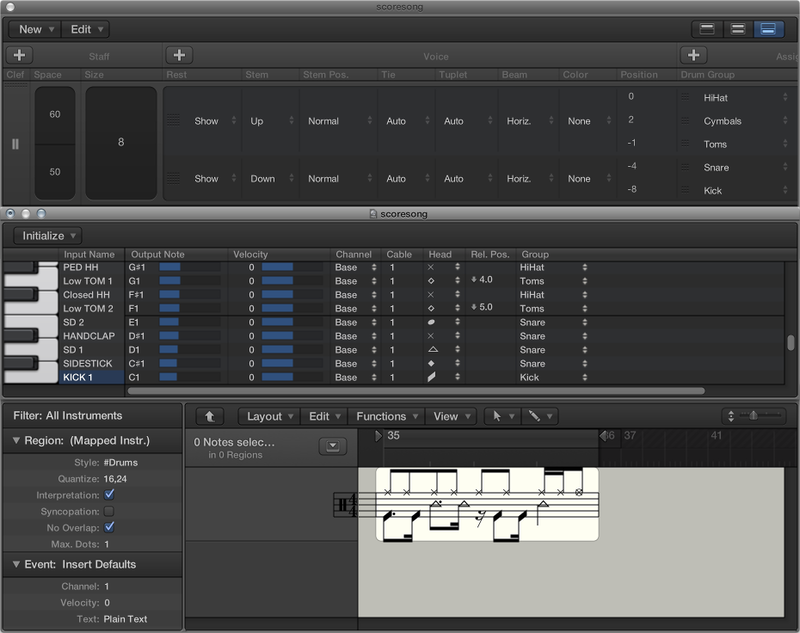 Create a mapped instrument in the Environment, then double-click its icon. For details about creating mapped instruments, see Mapped instrument objects overview. The Mapped Instrument window opens. Its default settings correspond to the General MIDI drum note assignments, but they can be edited. In the columns to the far right are three parameters relevant to notation. In the Head pop-up menu, choose the shape of the note head for notes triggered by this particular pitch. A note must be assigned to a drum group to be displayed in a mapped staff style. If it’s not, it won’t be visible. In the Group pop-up menu, choose a drum group. Some of the groups are predefined for the most commonly used drum sounds (Kick, Snare, Hi-Hat, Toms, Cymbals, and so on). Note: If you want to define a new drum group for another instrument sound (such as tambourine), choose New Group from the pop-up menu, then double-click the entry to name the new drum group. Set the Rel. Pos. (Relative Position) parameter. The Relative Position parameter assigns the note to a line in the staff. The note position is relative to the top line of the staff. Integer values make the note fall on a line; fractional values result in a note position between two lines. Note: Positions can also be influenced in the Staff Style window, but this affects all notes of a particular drum group. These options allow you to have two different MIDI notes (different bass drum sounds, for example) displayed in the same way in the score, or on the same line, but with different note heads. Create a new mapped staff style by choosing New > Mapped Style in the Staff Style window, and inserting all staffs, voices, and drum groups as described above, and in Staff styles overview. Staff section: Everything is identical to unmapped staff styles (with the exception of the missing Transpose and Key parameters, which wouldn’t make sense here). Voice section: Below Voice (in the top header line), is a separate Voice column, where the different voices are numbered automatically. The staff style shown above contains one staff with five independent voices. Horizontal lines: Display the Staffs-Voices-Drum Groups hierarchy, indicating the borders between these elements. Each drum group belongs to the voice at the same horizontal position. Pos parameter: Affects the vertical positioning of all notes in the corresponding drum group. The value shown here is an offset that is added to, or subtracted from, the relative positions (if defined for individual notes in the Mapped Instrument window). Mapped staff style names are preceded by the # character in the Staff Style window. If you’re using several software instruments with different drum assignments, you can create a separate drum map for each instrument (in the Mapped Instrument window). The list of drum groups, however, is the same for all instruments in a project. 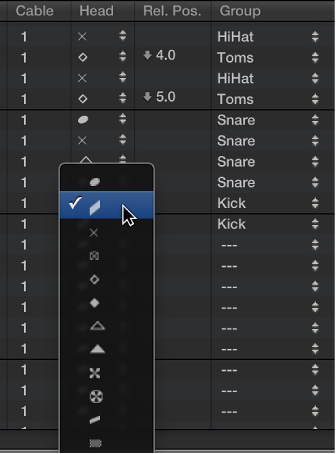 This allows you to display different drum tracks with the same mapped staff style. All snare drums, for example, will be displayed in the same way.